If you are unable to edit or manage your site then almost certainly you are not signed in with the correct account - ie. an account that has editor or owner access. If you believe you are the site owner and want to identify the 'owner account' of a site, then you need to send a 'Site sharing request' for that Site which will be delivered to the owner account(s) for that site. Site sharing requests are sent automatically to the site owner. This can be useful if you have forgotten the email address that was used to create the site. To send a Site sharing request, follow the instructions below. If after sending a Site sharing request you do not receive the sharing request email, first check that it hasn't been filtered out by your spam filter. If you still have not received it, then the most likely explanation is that it has been sent to an email address you have forgotten about - check any and all old email addresses you may have. Click on the link generated. Possible results are listed further down this page. Several different results are possible. Then click on the highlighted button to send a Site Sharing request to the Site owner(s) - success! 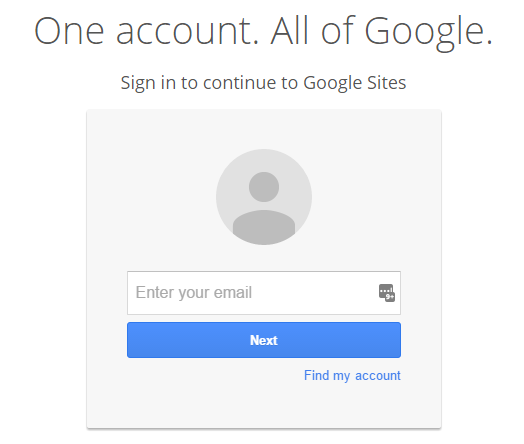 Then you are not currently signed in with any Google account. Sign in to Google with your Google account and try again. Then the site is a Google Apps Site and you need to sign in with your Google Apps ID for this domain or contact the Google Apps domain admin. and the address in your browser address bar begins 'https://sites.google.com/a/..', then this is a Google Apps Site and you need to sign in with your Google Apps ID for this domain or contact the Google Apps domain admin.